It sits on my beside table/cupboard/thing, which is why the lamp is there. And the speakers. It’s not finished finished, but it’s finished enough to post, I think. I set this up about a month ago, and I’ve been slowly figuring out what to put here ever since. I put the final touches on it today, so I thought I’d post it now, since I feel like it’s done, for now. 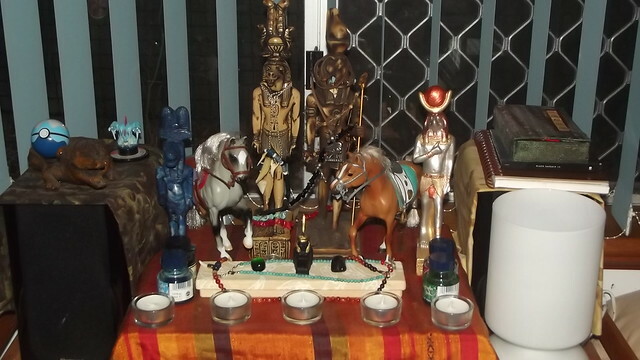 Hekate had Her shrine in the same place for the Rite of Her Sacred Fires for the May full moon, but Sobek quickly claimed the spot for Himself and Heru once that was done, so He’s got it now. It sits on the eastern wall of my room, facing the festival/household shrine on the western wall. Hekate has a smaller shrine on the shelf underneath my main festival/household shrine. I’ll post photos of Hekate’s new shrine at another time. Maybe on the other blog. More detailed pics and descriptions under the cut.